Distant chimes inform me this. A bell peal knells the mist. But some light gets blood going. hangs a canopy of needle leaf. There’s something that I lack. His woodworm didn’t have a chance. But I am not a ghost. So do not strike me, Heart. as birch bark, even damp. I’ve told the sum of my appeals. I need not watch for fox. They do not congregate at dawn. 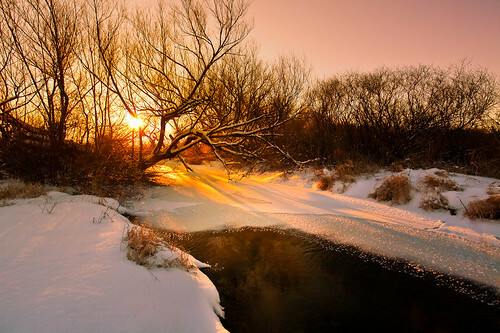 This entry was posted in Photos and tagged "Dane County", 2012, america, american, belleville, brook, brooklyn wildlife area, cann eos 5d, canon EF 17-40mm f/4L USM, cold, image, january, landscape, light, loren zemlicka, morning, nature, north america, photo, photography, picture, reflection, river, shadow, snow, stream, sun, sunrise, sunshine, Trees, usa, water, winter, Wisconsin by lorenzemlicka. Bookmark the permalink. Perfect time of day. Beautiful photo! Beautiful photo.. Thanks for sharing!